A very Happy New Year to all our blogfriends, and may 2009 be a very special and happy and fulfilling year for you and your loved ones. Today's post is not strictly Port Elizabeth. We are staying at Port St Francis, which is about 100 kms from Port Elizabeth. This shot was taken from the view point above the Port this morning, showing Seal Point, the lighthouse and the village of Cape St Francis. In the foreground is the nature reserve between Cape St Francis and St Francis Bay. This is definitely one of our favourite places on the planet. One of our favourite places to eat out is 34 Degrees South at the Boardwalk. It has a nice ambiance, a good menu to choose from, good service and a great view. Today was no exception and the Cape Salmon was superb. Update - 34 Degrees South closed down and has been replaced with a Spur. View of the Bay from Callington Street, Richmond Hill, with a container ship catching the last rays of the day. Many holiday makers are taking the opportunity to go for a helicopter flip. It leaves from Something Good and heads out to Cape Recife and returns to land with a flourish. Part of the new Radison Hotel can be seen in the bottom left hand corner - it is reminiscent of the old Trust Bank architecture. Another beautiful sunny day in the Bay, the water sport capital of South Africa. Today is the first Christmas in years that it has not rained in Port Elizabeth. It was in fact a perfect sun-shiny day. Though the beaches were fairly quiet this morning, the surfers took the opportunity to make the most of the waves at Something Good. Domino and Dumisa playing to the audience at the Port Elizabeth Oceanarium. We wish all our friends and visitors a wonderful Christmas and a fantastic New Year. Thank you for all your support and messages over the past year. Looking down Leather Lane from Municipality Road, towards the Russell Road Cemetary and the Dutch Reformed Church, in Campbell Street. The grave of James Langley Dalton, who was awarded Victoria Cross, after the battle of Rorkes Drift, can be seen at this cemetary. I will feature his grave in the new year. The cinema complex on the corner of Havelock Street and Rink Street shut its doors a while back and it is nice to see that it has reopened under new management. This shows that there are still people who have faith in the future of Central and are willing to make a commitment. We haven't been there yet, but will make a point of going there soon. The St Phillips Guest House is one of the more upmarket guest houses in Richmond Hill. It was built in 1912, as the rectory for the St Phillips Church. It is situated in St Phillips Street, alongside the historic St Phillips Church. When one embarks on a project such as this you need some serious equipment to get the job done. This "giant" crane is used to lift the the trusses into place. To get an idea of its size, look at the guy standing at the base of the crane. Yesterday's picture of the stadium shows the crane towering over the structure. There is a great deal of activity as the construction team prepare to put the next truss in place. From my observations it seems to take about a week to put one up. The crane truck is dwarfed by the crane. The Soccer Stadium is beginning to take shape nicely. We have watched the progress, as the team has put up the roof trusses, over the past weeks. This has been a slow process - I imagine it is like putting together a giant jig saw puzzle. Now that they have started to put the cladding on the roof, one can get a good idea of what the final product will look like. View of the stadium, which is situated alongside the Northend Lake, from Richmond Hill. This is the spectacular view from our daughter's bedroom door in Richmond Hill, on one of those lovely crisp days when it has rained, and cleared and everything is crystal clear. In the foreground you can see the fish farm near the harbour, beyond that a ship approaches port, and beyond that St Croix Island floats on a shimmering horizon. We are actively involved in neighbourhood patrols, spending several hours in the middle of the night each week, trying to take back our neighbourhood from drug dealers, pimps and thieves. On days when we wonder why we put up with the crime around us, we look at views like this and are reminded that it is worth it, and we are encouraged to continue our efforts. Row of cottages in Ivy Street, along the Donkin Heritage Trail in Central on a clear ans sunny day. This well maintained settler cottage was built circa 1863 in Ivy Street, Central. It along with many other cottages of the time, can be seen on the Donkin Heritage Trail. Picturesque old cottage in Military Road, in one of the older parts of Central. Looking down on some of the older buildings in Govan Mbeki Avenue (formerly Main Street), built in the days when this section was still known as Queen Street. These buildings stood on the beachfront in the old days and everything behind them is reclaimed land. It is a beautiful day and the Bay and the start of the holiday season. Pollock Beach was quieter than the other beaches today, with no wind and clear skies. Out in the ocean too far away to photograph, were two hump backed whales making their way acroos the Bay and far in the distance was a school of about 2000 dolphins in a feeding frenzy. For some beautiful photos of whales, dolphins and other animals in the Bay visit the Raggy Charters website. In all my years of watching clouds, this is something I have never seen before. When fetching our kids from the airport recently, we were greeted with shimmering pearlescent clouds as the lowering sun caught them at just the right angle to create irridescent colours across them, and we went home gasping at the sight of emerald green clouds. To see more Skywatch photos, go to the site and follow the links, you'll see wonderful photos and meet a great bunch of people from around the world! This is for regular reader and ex-PE girl Brenda, who lived here a while back. We featured a "Then and Now" of her at the house in 1949 (now now, it isn't gentlemanly to do the maths!) recently and she wanted to see how it looks now, so here you are. I loved the graphic quality of the play of light and shadow on these derelict train sheds at the narrow gauge train station. Standing on the freeway last weekend, looking seawards, this was the lovely view that we saw of the sea mist rolling back from the Swartkops River Mouth. ....or, making the best of a bad situation! This tree on a sidewalk in Mackay Street, Richmond Hill that was cut down has regrown, leaving the rather odd stump surrounding the new tree. Someone with a quirky sense of what is stylish decided to "beautify" it! Richmond Hill and Central have earned themselves reputations as the crime hotspots of Port Elizabeth. To a degree there may have been some justification for this, but that is rapidly becoming a thing of the past. The activities of the Richmond Hill Sector Crime Forum have made the area an uncomfortable place to commit crimes in, and there has been a marked drop in crime stats recently. This is because the community, instead of isolating themselves behind bars, have joined forces to act against crime, and the positive spinoff of this has been a great increase in neighbourliness and community spirit. This was particularly evident today, at the final meeting of the year, which was held at Richmond Park in the form of a community picnic. The kids had a ball, and a certain dude in a red suit also showed up and gave them tractor rides around the park. Despite a huge amount of opposition from local residents, and despite the fact that much of the land they plan to use is an historic burial ground for the Mfengu people who lived in Richmond Hill in the 1800s, the PWD and Police seem determined to go ahead and erect a 4 storey eyesore on the site next to this lovely historic building. They will effectively block most views of it, as well as casting the park into shade for much of the day. The arrogance and patronising attitude of the officials who attended the public meeting last night was unbelievable. It seems that, 14 years into democracy, little has changed in some departments! instead of an actual photo of PE, here is a photo of a painting of PE! Looking down Parliament Street towards the bay. Oil on canvas, 750x950mm. If you are not going to be here, but would like to see more, I have posted some of the new paintings on my art blog. At the Eastern edge of Port Elizabeth runs the Swartkops River, and there is a delightful little village on the bank of the river, overlooking the city. 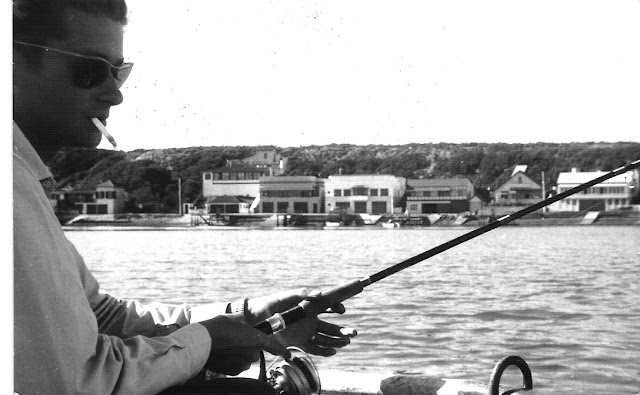 This part of it has changed little over the years, as you can see from this photo of our French friend, Gaston, fishing there back in 1959. But over the hill, it has grown a lot, and stretches out towards the East, with shops and garages etc. Yesterday, as I often do when I am wandering around the house, I looked up to check the view through the front window, and there wasn't one! I checked the side window to see if a mist was coming in but it was bright and clear... so I realised I was looking at a fire in the valley. And the smoke was soon joined by clouds of steam as they hosed down the surrounding vegetation. You can spend your whole life in Africa and not see one of these in the wild. Caracals are shy elusive nocturnal creatures, and have been made even more so because they have been hunted by farmers to the point where it is very rare to see one. This one posed obligingly at the side of the road, obviously reluctant to give up its warm sunny spot in the soft sand .... we were over the moon, and it really made up for the fact that the lions again eluded us. Anyway it gives us a good reason to go back soon!